Keith W. Olson’s Watergate: The Presidential Scandal that Shook America is a short introductory text to the Watergate episode, but Olson does more than recount the story of the Watergate break-in, the subsequent cover-up, and the investigative process that ended in Richard Nixon’s resignation: he makes an important argument about what Watergate reveals about American politics during the revolutionary decades that followed the Second World War. Nixon’s acts, Olson argues, were not an aberration, but a “[reflection of] the political values of the system.” That system, in turn, can be understood as acting in reaction to what were perceived as serious challenges, both internal and external, to American political stability. 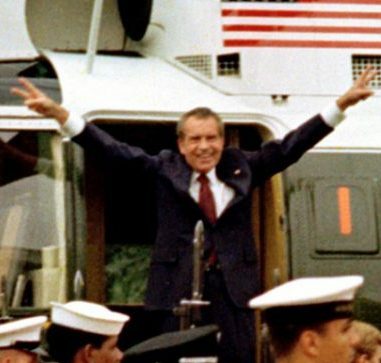 One reason to understand Nixon’s actions as reflecting the values of the system is the fact that, unlike the current occupant of the White House, Richard Nixon was not a political outsider: he was a product of the system, with a career track that put him well in the mainstream of Cold War-era politics. Politically, Nixon was a proud anti-communist and internationalist when those two qualities were foundational to American political discourse. He was elected to the House of Representatives as a Second World War veteran in 1946, and won a Senate seat four years later. While in Congress, he earned national attention for his work on the House Un-American Activities Committee, cementing his reputation as a anti-communist stalwart. Nixon served as vice-president under Dwight Eisenhower for eight years, and narrowly missed becoming president in 1960. Even in defeat, we can see his mainstream popularity: Nixon won more votes in 1960 than did GOP candidates for the House. When he won the presidency in 1968, he did so even as the Democrats took both houses of Congress. Moreover, not only did Nixon have a classic insider career track, the system in which he operated tolerated abuses of power in the name of national and partisan political goals. In 1956 the FBI launched COINTELPRO, to monitor, infiltrate, and disrupt radical movements including the civil rights and Black Power movements, anti-war activism, and feminist movements. Most infamously, as part of COINTELPRO, the FBI anonymously contacted Martin Luther King in an attempt to convince him to commit suicide because they had information about his extra-marital affairs. Sometimes the objects of surveillance were not radical activists, but political opponents: during the 1964 campaign, President Lyndon Johnson had the FBI monitor fellow Democrats out of fear that he might lose his party’s nomination. Johnson also had Nixon secretly recorded during the 1968 campaign. Nixon may have brought political dirty tricks to a new level, but he operated in an environment where illegal and quasi-legal surveillance and political interference were widely accepted. There was, to the people in power in the years leading up to Watergate, a critical justification for playing fast and loose with the rules. In the 1960s and 1970s, it was easy to believe that America faced existential threats, not only from international communism, but from an internal rebellion that many in the establishment feared could undo America’s political foundations. From the Alien and Sedition Acts through the internment of Japanese-American citizens during the Second World War, the expansion and abuse of presidential power has always been a reaction to perceived threats to American security. During the Vietnam era, Olson writes, anti-war activism “contributed to a defensive mentality within the White House, a reflex to strike out at opponents, and a penchant for secrecy.” Fear of the communist threat from abroad led to suspicion of forces working for change within the country. In 1967, the CIA launched Operation Chaos, an internal intelligence operation meant touncover foreign involvement in domestic dissent. By 1972, American leaders believed the anti-war movement could tear the country apart. Nixon speechwriter Pat Buchanan mused that if Nixon lost in 1972, the country might go down with him. Nixon’s chief of staff, H.R. Haldeman argued that people who critiqued Nixon’s Vietnam strategy were “consciously aiding and abetting the enemy of the United States.” It may be tempting to understand statements like this as empty political rhetoric or cynical fear-mongering, but that reading is not compatible with Nixon’s deeply-seeded commitment to fighting international communism, a power he believed could reach into the American polity and subvert the country from within. That said, understanding that there was an internally-consistent rationale for acting outside established rules and norms should not blind us to the scope of the actions undertaken by Nixon and his team. Nixon and his men took Cold War paranoia to new heights and engaged in surveillance and interference efforts that went much further than those of their predecessors, including acting against their own people, such as getting the FBI to tap the phones of Nixon counsel John Sears and speechwriter William Safire. The culture of paranoia was not limited to the office of the presidency: it pervaded parts of the government and the military. National Security Advisor Kissinger had the FBI tap the phones of National Security Council officials who were suspected of leaking. In some cases, the taps remained in place for months after the targets had left their positions, including, in one case, an NSC official who had gone on to work for Ed Muskie’s campaign to be the Democratic presidential candidate. In another case of internal surveillance, the Joint Chiefs of Staff spied on the National Security Council to get intelligence that was being withheld from them. But there were some operations that Nixon felt could not be trusted to the law-enforcement or intelligence establishment. Nixon had White House Counsel and Chief Domestic Advisor John Ehrlichman set up a parallel domestic intelligence-gathering operation. Nixon’s rationale for this was rooted both in political concerns and his resentment of people who came from more privileged social backgrounds than he, a common theme in psychologically-oriented analyses of Nixon’s behaviour. Nixon saw FBI head J. Edgar Hoover as beyond his control, and thought that the CIA was incompetent because they were unable to connect the anti-war movement to international communism; Nixon also saw CIA director Richard Helms as too “old-school-tie” to be fully trusted. Ehrlichman hired a former NYPD detective named John Caulfield, who had served as a security liaison to the 1968 Nixon campaign, to run this off-the-books intelligence-gathering operation. Caulfield in turn hired a former colleague named Anthony Ulasewicz as an assistant; while Caulfield was on the White House payroll (as a liaison with federal law enforcement agencies), Ulasewicz was paid out of leftover ‘68 campaign funds. One project that the duo worked on was trying to gather dirt on Edward Kennedy after the Chappaquiddick incident, but it was a case of the leaking of classified Pentagon documents that revealed the extent to which the Nixon White House was willing to use illegitimate methods to go after perceived domestic enemies. The case also demonstrated how the White House saw the anti-war movement as a threat to national security. In 1971, Daniel Ellsberg, a Pentagon analyst who had come to oppose the war in Vietnam copied and leaked the Pentagon Papers, a secret official history of the Vietnam war. The Pentagon Papers revealed that the United Stated government had systematically lied to both the American people and to Congress about the war, and had hidden secret military actions including bombings of Cambodia and Laos and incursions into North Vietnam. Nixon, distrustful of the FBI’s abilities, had Caulfield and Ulasewicz investigate Ellsberg. They were supervised by two White House aides, Egil Krogh Jr. and David R. Young Jr., who were known as “the Plumbers” because the were charged with stopping leaks. The Plumbers reported to Ehrlichman and assistant to the president Charles Colson. Their numbers expanded to include two key figures in the Watergate story: E. Howard Hunt, a twenty-year CIA veteran who had worked on the coup in Guatemala in 1954 and the failed Bay of Pigs invasion, and had served as the head of the CIA’s Domestic Operations Division; and a psychopathic former FBI agent and Treasury Department lawyer named G. Gordon Liddy. The Plumbers engaged in a variety of plots meant to harm White House enemies, including attempts to link JFK to the 1963 coup against South Vietnamese president Ngo Dinh Diem, and an abandoned plot to murder journalist Jack Anderson. Hunt, with funding from a public relations agent representing the dairy industry, hired three Miami-based Cuban expats, including Bernard Baker, a CIA agent and former member of Fulgencio Bautista’s secret police to break into the offices of Ellsberg’s psychiatrist in the hopes of finding material that would discredit the former Pentagon official. While they were unable to find anything of note, the Ellsberg operation is central to the Watergate story because the cover-up of the later break-in at the Watergate building was meant, in part, to hide the links between the White House and the Ellsberg operation. The Nixon White House’s propensity to engage in illegal and norm-breaking activities in the name of both national security and political partisanship differed in degree from that of its predecessors, but it did not differ in kind. In the context of an existential external threat in the form of international communism and existential internal threats in the form of racial uprisings and sharp resistance to an increasingly-unpopular war, American political leaders thought it necessary to break the law and violate established norms in order to protect the political order. As the case of Lyndon Johnson’s surveillance of his own party demonstrates, the line between engaging in questionable activities in the name of national security and doing so for political reasons could be crossed. Olson is not asking the reader to forgive Nixon, only to understand, on Nixon’s own terms, why he did the things he did. Next time: CREEP’s dirty tricks. Next ›Keith Olsen on Watergate. Part II: Dirty Tricks, Illegal Money, and the Break-In at the Watergate Building.